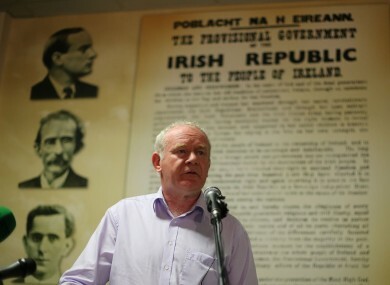 Martin McGuinness at the Rath Mór Sinn Fein Centre in Derry today. SINN FÉIN’S MARTIN McGuinness has used a keynote speech marking the 20th anniversary of the 1994 IRA ceasefire to call for dissident republicans to lay down their arms. Addressing around 300 people in a speech in the Creggan area of Derry, the Northern Ireland Deputy First Minister said there was an enormous onus “on those who recognise the enormous progress we have made, and continue to make, since the IRA cessation in 1994 to make their voices heard”. “There can be no return to the violence and repression that scarred this society for so long,” he said, according to Sinn Féin newspaper An Phoblacht. I would urge dissident republicans still committed to armed actions to take that same step in 2014 into politics and away from conflict. Previous IRA ceasefires had dissolved in waves of violence, but the 1994 announcement was immediately given more credence as it came in the midst of intensive political talks, which included Sinn Féin for the first time. However, it was broken in 1996, and two people were killed in a bomb explosion in the docklands area of London. A renewal of the ceasefire was announced the following year. “The absence of dialogue and a commitment to dialogue as the way to overcome disagreements is at the heart of the growing difficulties we are now facing in the Peace Process across a range of key issues,” McGuinness said in his speech. Rather than making progress on the issues of identity, parading and the past by building on the enormously important work carried out by Richard Haass and Meghan O’Sullivan, the DUP and the UUP have now retreated into a coalition with rejectionist unionism and loyalist paramilitaries. “Three times in the last six months, the DUP have threatened the political institutions if they do not get their own way. “But the real threat to the political institutions is stagnation and the absence of progress. “The real threat is the retreat of political unionism from dialogue, compromise, agreement and reconciliation. I have personally tried to understand and reach out to the unionist population, not least in my engagements with Queen Elizabeth. But reconciliation is not a one-way street. Unionist leaders need to engage in similar initiatives. McGuinness also said the supporters of the peace process internationally, “in particular in the United States of America” needed to “reassert their interest and influence”. It follows talks conducted by former US senator Gary Hart with the five main political parties this week to explore the extent of the problems at Stormont. The former US presidential candidate traveled in a private capacity, but did so after he was asked by Secretary of State John Kerry, a friend and former colleague, to assess how the US could assist the parties in finding a sustainable solution to the ongoing problems of flags, parades and the past. However, there appears to be some disagreement as to how much involvement the US should have in Northern Ireland affairs, with the DUP’s Nigel Dodds insisting on Thursday that there was “no role” for the administration, and that problems should be sorted out internally. Email “'Step away from conflict': Martin McGuinness's peace plea to dissidents”. Feedback on “'Step away from conflict': Martin McGuinness's peace plea to dissidents”.